France 2018 World Cup kits for Dream League Soccer 2018, and the package includes complete with home kits, away and third. All Goalkeeper kits are also included. This kits alos can use in First Touch Soccer 2015 (FTS15). The local shirt makes use of the navy blue color that Les Bleus usually wear since the arrival of Nike, combining with blue king fabric on the sleeves. 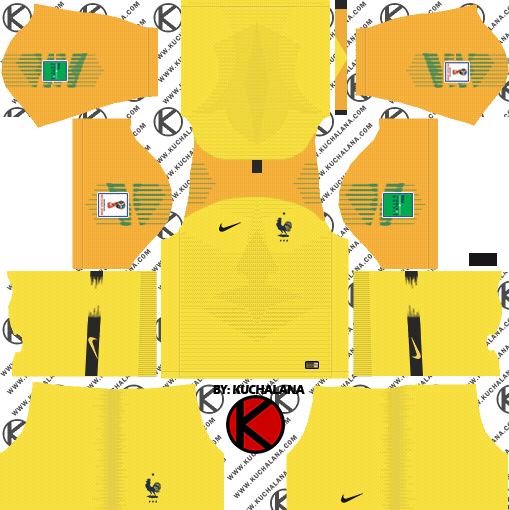 The rooster of the FFF is presented in silver, accompanied by the star of the 1998 World Cup, while the Nike Swoosh and the bibs are painted white. 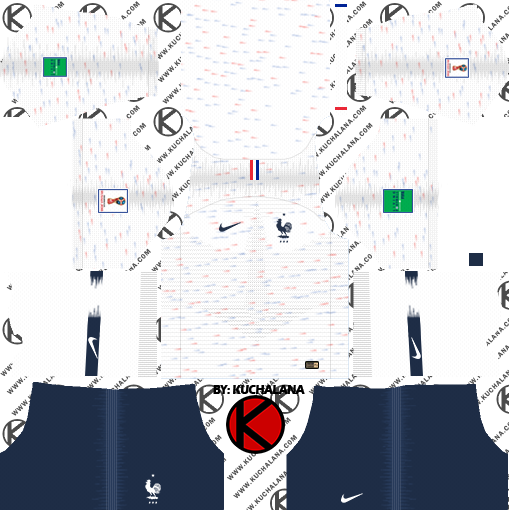 A flag detail adorns the back of the neck, which also houses a hexagon (the shape of France on a map) with the phrase "Our Differences Join Us" on the inside. The button in front contains the words "Liberté, Egalité, Fraternité" ("Freedom, Equality, Fraternity"). 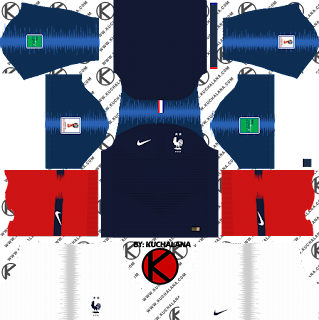 The uniform is completed with white shorts and red socks. The visiting shirt is, according to Nike, a deconstruction of the National flag. The white base is combined with eye and blue touches incorporated in the fabric, which combine with the logos and numbers in navy blue. A flag detail adorns the back of the neck, which also houses a hexagon (the shape of France on a map) with the phrase "Our Differences Join Us" on the inside. This shirt will be combined with blue shorts and white socks. 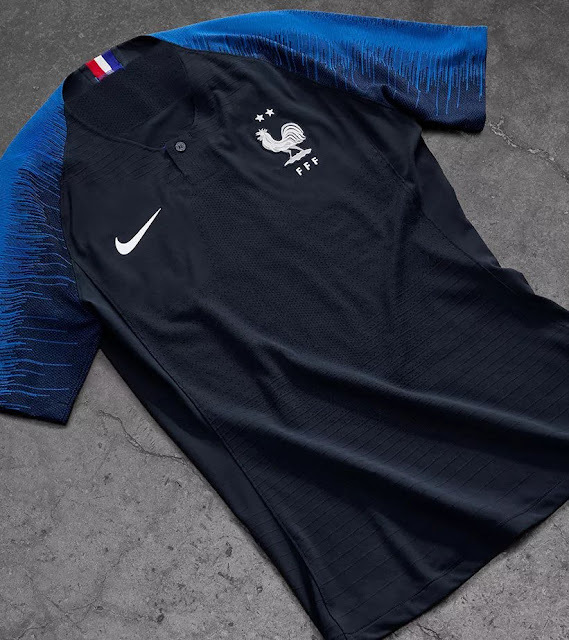 UPDATED : The Nike France 2 Star jersey is an updated version of the France 2018 World Cup kit featuring two stars to celebrate France's second World Cup title. 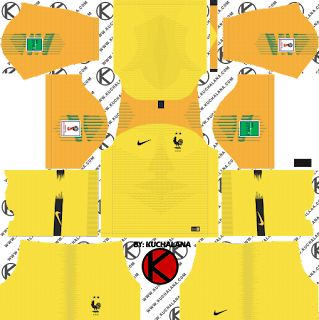 13 Komen untuk "France 2018 World Cup Kit - Dream League Soccer Kits"
Make with world cup winner badge!!! !